To throw the perfect Jungle theme party you'll need something to eat from, drink from, and wipe your mouth on. Why not choose from our selection of great Jungle Tableware. We have the Smiling Safari and Monkeying' Around tableware set. 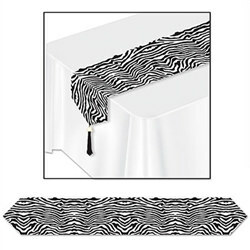 We also have hot/cold cups, dessert plates, luncheon plates, dinner plates, beverage napkins, and luncheon napkins in a Leopard Print design and zebra print if you’re planning a party for someone that can't get enough of their animal prints. Whatever the age group we have jungle themed tableware that will be perfect! If you’re throwing a Jungle themed birthday party, make sure you include some of our great Jungle Tableware and other jungle party decorations. And be sure to ask about our bulk discounts on select products! No matter what kind of Jungle Tableware you are looking for we’ve got you covered right here! So come party with us! We’re PartyCheap.com and we know how to party! If you are planning a jungle theme party for your little one you will have to have matching tableware! Our Monkeying' Around tableware is perfect for your jungle theme party! We have plates, cups, and napkins in the Monkeying' Around design. We also have a Smiling Safari design tableware is also a good choice for your Jungle theme. We also have matching plates, cups and napkins in this design. If you are have a girl that is into animal print designs we have a zebra print design, Leopard Print and Giraffe Print design. You can pair any of these with a colored or black table cover to create and awesome animal atmosphere. It is our goal to provide our loyal customers with the best possible products for the lowest possible prices. And of course we always love hearing from our customers! If you have any questions or even a new idea for a product you’d like to see on our website, give us a call or leave us a message! We’d be happy to hear from you! And who knows? You might just see your idea on our website in the near future! No matter what kind of jungle themed tableware you’re looking for we’ve got you covered! We’re PartyCheap.com and we know how to party!